I think I made out like a villain. I got all of these lovely sweaters for about $13. The light colored ones are all cotton, and are destined to become part of future art projects. 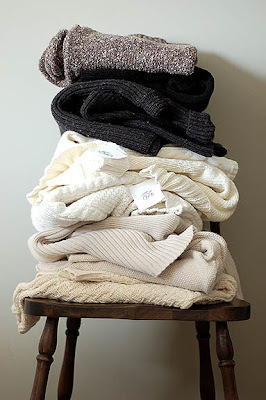 The darker ones, on the other hand, are very nice merino wool sweaters. 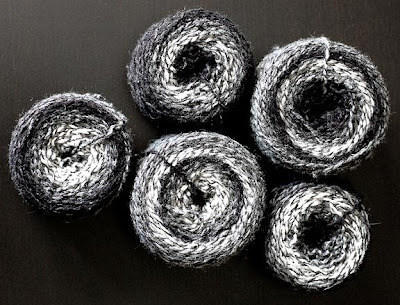 They are destined to become knitting projects, or at the very least, lovely skeins of yarn. It was a boxy short sweater made from beautiful self-striping wool yarn. 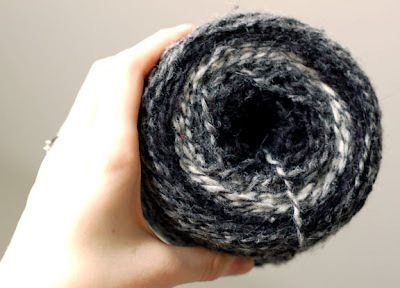 Think Noro but softer and 2-ply. Lovely eh? I got a pretty good amount. Enough for a sweater or a hat/scarf/mitten set. Lastly, here my piece from the Ars Nova show! I've stolen this photo from the gallery's website... On the right of my piece is my good friend Kim Strom's piece. She landed first prize in the show! Congrats Kim! I also went to two other shows last night, one at Gallery 214, and one at Bad Dog Gallery. More on those later though, I'm off to head home for Easter! Thanks! I am amazed how fast info can travel. I just took the photo today and sent it to our web master this afternoon, and here it is on your blog! Can't wait to see how the sweater project progresses. loving the sweater project! 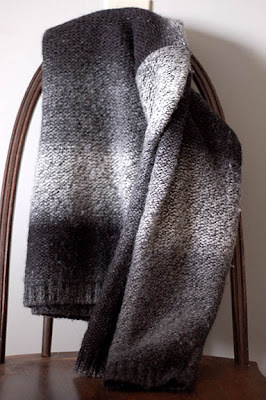 Love how you made some super bulky yarn with the cotton. :] and you scored on the merino! I just wanted to say that I really enjoy reading your blog. I'm good friends with Athena and may have met you once or twice during the gallery walk way back in the day. I've seen a lot of your watercolor work and you are really talented. Great stories and photos, as well as all your projects. I love that you recycle yarn! It's such a great idea. Kim- haha, i think i am just an internet addict! One of your followers thanked you for a link about how to unravel a sweater so you can reuse the yarn. I have tried to find that link on your site, but I am a bit of a novice with the blogosphere. Could you please send it again?